In this paper we present our QA@CLEF 2007 version of Quantico, a cross-language open domain question answering (QA) system for German and English document collections. The main features of the system are: use of a preemptive off-line document annotation with linguistic information; online extraction of abbreviation-expansion pairs and appositional constructions for the answer extraction; use of online translation services for the crosslingual scenarios; use of redundancy as an indicator of good answer candidates; selection of the best answers based on distance metrics defined over graph representations of the answer’s context. The results of evaluating the system’s performance by QA@CLEF 2007 were as follows: for the German-German run we achieved an overall accuracy (ACC) of 30 %; for English-German 18.5 % (ACC); for German-English 7 % (ACC), for Spanish-English 10 % (ACC) and for the Portuguese-German run 7 % (ACC). 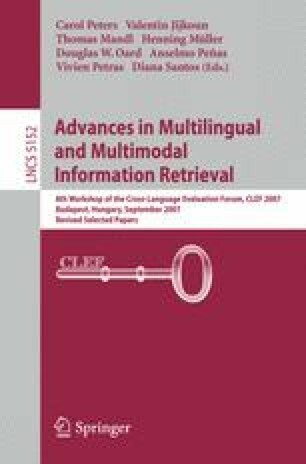 The work presented in this paper was partly supported by the European Commission, contract FP6-33860, Question Answering Learning technologies in a muliLingual and Multimodal Environment (QALL-ME, http://qallme.fbk.eu/ ) and by a research grant from the German Federal Ministry of Education and Research (BMBF) to the DFKI project HyLaP ( http://hylap.dfki.de/ , FKZ: 01 IW F02).